Cambie Street just got a little ‘denser’, in more ways than one. By approving Phase 2 of the so-called Cambie Corridor Plan, not only did the Vision-led City Council open the door to higher condo developments along the stretch, it also proved its own ‘density’: its incapacity to respond to residents, to stand up to developers, or to adequately address Vancouver’s staggering unaffordability. The Cambie condo plan calls for upzoning the full length of Cambie St, from City Hall to South Marine Drive. Six-storey condo development would be allowed along almost the entire stretch, punctuated by 12-storey condo towers around Oakridge Mall, and 40-storey ones at Marine Drive. In the midst of our almost pathological affordability crisis, where Vancouver often ranks as the most unaffordable city on the planet, it is crucial take advantage of every opportunity to create affordability. But in the Cambie plan it is anticipated that at least 80% of new units will be unaffordable condos, and the remaining 20% purpose-built rental units will go for an unsubsidized market price. This upzoning is the second free give-away to Cambie private property owners in recent years. First, construction of the Canada Line pushed up land values, especially around transit stations. Simply, people will pay more to live near them, so developers can profit by building condos for speculators and prospective upper-income buyers. But contrary to the logic of using better transit to increase property values, it is a matter of justice to build purpose-built affordable rental housing around transit hubs. It is lower income residents who can’t afford to drive cars. With land values rising around Canada Line stations, public intervention into the market would be required to retain or create low- and middle-income spaces (residential, commercial, and public spaces). For example, downzoning could be used to keep land values under control, so that land can first be secured by public agencies for the purposes of public housing. Rent Caps or Rent-Geared-to-Income (RGI) could be enforced. But on the contrary, the Cambie Corridor Plan serves no purpose other than to multiply property values along the stretch yet again. Both residential and commercial tenants will be duly evicted, while property owners sell-out to larger development companies consolidating land-holdings for condo complexes. The irony should not be lost that Gregor Robertson’s main accomplishment as an MLA was advocating for small commercial tenants on Cambie Street whose businesses were disrupted by construction of the Canada Line. They will now be dislocated wholesale by property owners without a semblance of consultation or compensation. 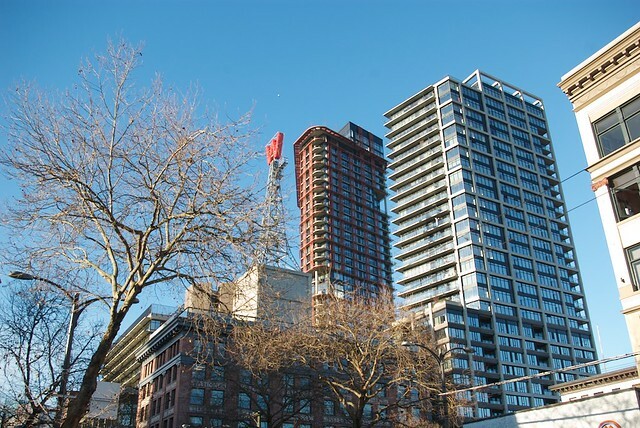 Over the past two years, Vancouver City Council and its Planning Department have been increasing height allowances throughout the City. 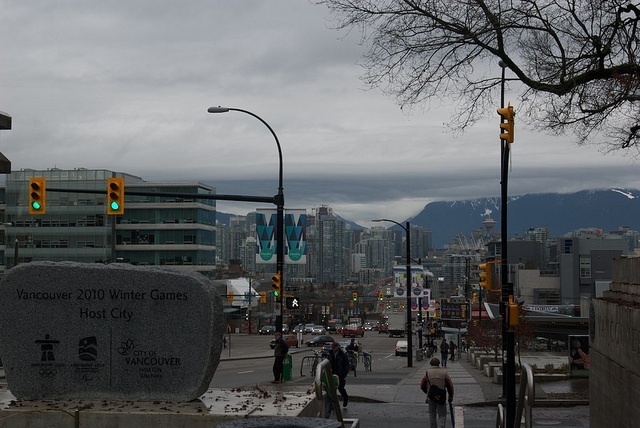 Almost every neighbourhood faces or has faced either a wide sweeping height plan or a precedent setting rezoning application: the DTES, the West End, Mt. Pleasant, Norquay, the CBD, and now Cambie St. This surge in upzonings is a key causal factor of Vancouver’s plummeting affordability. In their current form, increases in height allowances essentially constitute deregulation of the real-estate market. By removing limits placed by either community-led groups or the planning department, developers can build whatever they think will be most profitable on a piece of land. In Vancouver, this means maximizing views, which means maximizing height. It also means luxury condos. If this process continues, the City’s affordability will continue to worsen. Increasing height and density allowances on a piece of land drastically increases its value. Whether through a neighbourhood-wide ‘blanket rezoning’, or through a single plot ‘spot rezoning’, increases in density equate to windfall profits for real-estate developers. Even without any new construction, upzoning a parcel of land plays a huge role in how it is valued. This is why developers buy up properties and then “donate” to political parties like Vision Vancouver, with the expectation that their properties will be upzoned. This can lead to spiraling speculation throughout an area. There is a lot of money to be made from these rezonings. By deciding to arrest the group of eight, Mayor Robertson made a clear choice, sending a clear message. Robertson is no longer the “End Homelessness” Mayor. Robertson created almost no new social housing during his first term. His one and only significant initiative was opening these emergency shelters, which concluded in this “week of shame” of 200 evictions and eight arrests. 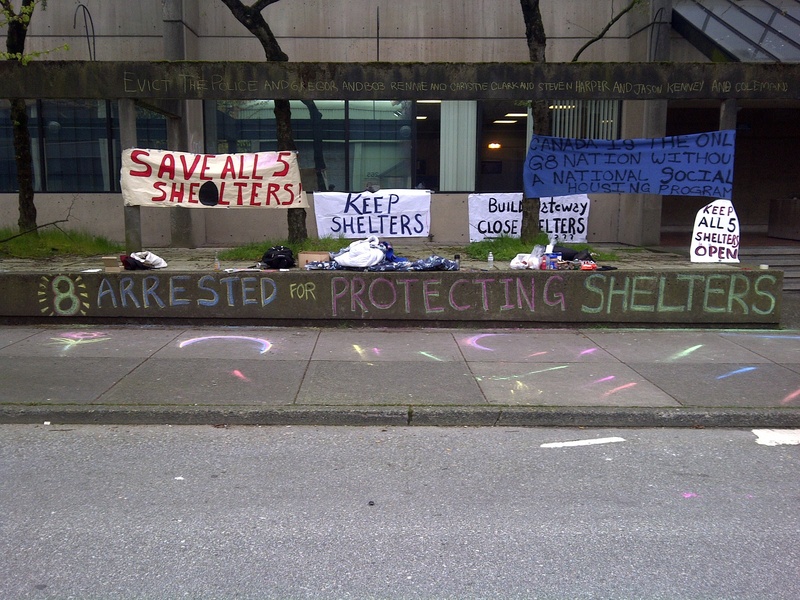 The Broadway and Fraser St shelter was the fourth shelter this week slated for closure by the City and Province. The shelter is the largest of the four, and is widely understood to be the safest for women. The City-owned space will now sit empty for at least the next six months. A rally was held outside the shelter Friday morning, attended by over 50 shelter supporters. There were speeches by shelter residents and housing advocates. “Some of my friends here are probably going to die if we are forced back to Downtown Eastside SROs,” said one shelter resident. The evictions were to be complete by 11am, but several dozen residents and advocates occupied the large building. Throughout the day, activists helped residents negotiate with BC housing for better “alternative arrangements.” Activists promised to leave the building only once each shelter resident had secured appropriate alternative arrangements. At 8pm, back at Fraser & Broadway, there remained several dozen people in the shelter, including residents who were committed to keeping the shelter open. The shelter remained filled with the belongings of evicted residents. Police, under orders from City Deputy General Manager Brenda Prosken, told everyone to leave under threat of arrest. The squatters decided that a core group of eight would take a stand to keep the shelter open for all who need it. The group of eight sat in a circle in the middle of the shelter, putting the decision clearly to the City General Manager and Mayor: if you want to shut down this homeless shelter, the fourth in one week, you will have to arrest eight peaceful demonstrators to do so. And where was Robertson himself throughout the week? Announcing his New Deal with developers to drive through massive, but unspecified, re-development of the central business district. I don’t remember that being a key Vision priority. Maybe they can build a condo tower on the site of the Howe St shelter. Five homeless shelters are scheduled for closure in Vancouver this week because the provincial government refuses to regularize funding. Each of the 5 shelters has a capacity of 40 people. One of the five shelters, at Fir and 4th, was already shut down last Wednesday. About half of those kicked onto the street were seniors, according to Gail Harmer of the Council of Senior Citizens of BC (COSCO). Some of the seniors were offered SRO units in the Downtown Eastside, but all refused because of the deplorable conditions of the SRO units. 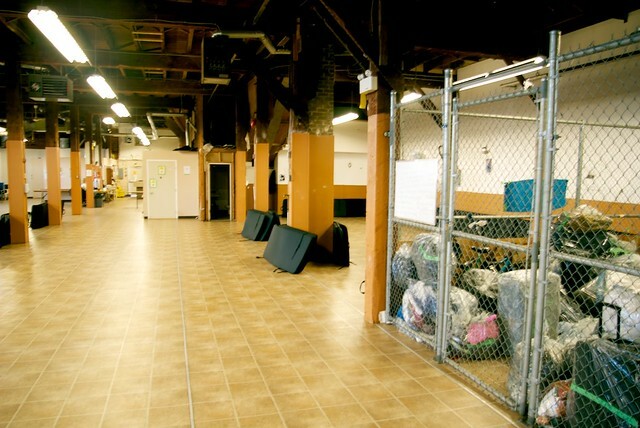 Three of the shelters, run by RainCity, are set to be shut down this week. 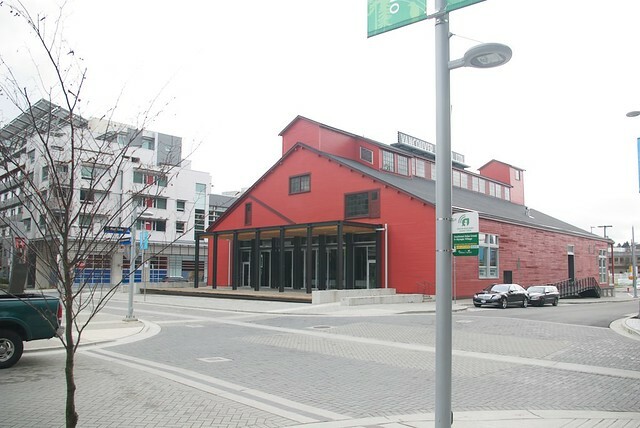 One of these, the Cardero St. shelter in the West End, is set for closure this Wednesday, April 27th, despite support from many local organizations – even the Downtown Vancouver Business Improvement Association (DVBIA). There had been a noticeable reduction in street homelessness in the West End, but since the Cardero St. shelter stopped accepting new residents at the start of April, more people are living on West End streets. A coalition of organizations is scheduled to hold a press conference at the Cardero St. shelter tomorrow demanding that all the shelters be kept open until appropriate housing is secured for the shelter residents (see media release below). The fifth shelter is the New Fountain shelter on Cordova St. Earlier today, Housing Minister Coleman announced that he would extend funding for the New Fountain shelter for only two months, and would not fund the other four shelters at all. This announcement was timed to distract from the fact that four shelters are being shut immediately. The results from the March 20th hearing were displayed last night at a City-hosted open house. The Heritage Hall on Main Street was full of concerned citizens giving feedback on the modifications that City staff have since made to the Rize Development’s rezoning application. Most of the changes had to do with the height and scale of the building. What had been a 26 story tower has been downsized to 19 floors. The massing has been decreased on Watson and 10th Avenue, but increased on the side facing Broadway. A huge majority of residents said that a building between 6 and 12 stories would be more appropriate for the location – the smallest option on the City’s feedback forms. The drop in height reduced the density from 6.44 FSR (Floor to Space ratio) to 5.33 FSR. This is still significantly higher than the standard 3 FSR for the neighbourhood. Another new development containing social housing was talked down at City Hall from 11 stories to only 8 last July. The massing and form are now set to be similar to those of the Lee Building on the North-West corner of Broadway and Main. The developers have been trying to spin this new tower as becoming the “signature” building for Mount Pleasant, but most see the historic Lee Building as already filling that role. While the City has lowered the building by a few floors, as proposed it is still almost twice as tall as anything else around the Main and Broadway hub. To meet the concerns of the community, the development will still have to change significantly. The City will also need to find a way to address the neighbourhood’s affordability concerns. As it stands the development would still be very detrimental to the socio-economic makeup of Mount Pleasant. Most of the residents were also against the Community Amenities and Benefits that had originally proposed. People are concerned that even the STIR (Short Term Incentives for Rental) housing would not be affordable to people who currently live in Mount Pleasant. STIR units rent at market rates. Mount Pleasant has traditionally been an affordable, working class neighbourhood, and STIR rent in a luxury tower would likely be much higher than most in the neighbourhood could afford. In combination with the market rental, some community art space and public art have also been proposed to compensate the community for the developer’s gains from rezoning. Many were concerned that the proposed artist space would be too expensive for artists, and that artists are finding it increasingly difficult to afford to live in the neighbourhood. At the open house, there was an opportunity for residents to express further concerns. The sense in the room was that 19 stories is still much too high. 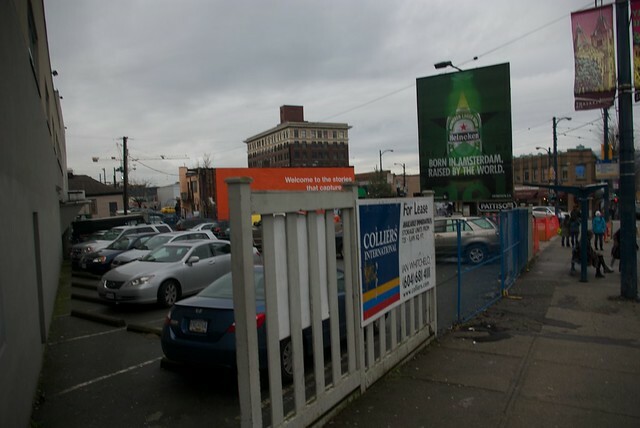 Height is being framed as the major issue for this development, but there are also serious concerns about who will be able to afford living in Mount Pleasant. Residents are worried that this development will have a domino effect, leading to further large luxury condos being built in the neighbourhood. The council meeting for this development has not yet been announced. More information is available on the City’s website for the rezoning here. Over two hundred people packed themselves into the still-empty Salt building at the Olympic Village on Sunday afternoon. They were there to hear from the City and developers, and to have their say about the 26 story luxury tower planned for Broadway between Main Street and Kingsgway. Most of those who attended were property owners in the area, with a few renters in the mix. Several business owners, renters, and concerned citizens from outside of the neighbourhood were also present. The sentiments expressed in the room were almost unanimously against the project. Most of the discussion seemed to focus on the height of the building. The development is twice the allowable density for the neighbourhood at an FSR (floor to space ratio) of 6.44, compared to the current zoning FSR of 1 and the allowable FSR of 3 for the neighbourhood. Concerns about the height are focused on several issues in particular. A tall building will set a precedent for the allowable height and density in the neighbourhood in the future. Many attendees claimed they didn’t want a “Yaletown-sized tower” in their neighbourhood, and that this tall building in particular will block sunlight from hitting the well-used streets to the North and East of the development. The most problematic effect of the tower will be on the affordability of the neighbourhood. It is increasingly difficult to find a reasonably priced place to live in what has historically been a working class neighbourhood. As Mount Pleasant is one of the few remaining “affordable” neighbourhoods in the city, many residents are faced with leaving the city altogether, and Mount Pleasant is their departure point. A luxury tower built without a comparable amount of affordable rental housing built in the neighbourhood would have the effect of increasing property taxes and rents in the neighbourhood. Another serious problem with the consultation was the social representation at the meeting. Mount Pleasant, in addition to being a working class neighbourhood, houses many immigrant families. A 2008 report by the PIVOT Legal Society was very explicit about the problems faced by immigrant families who rent in Mount Pleasant. It notes the difficulties that many families have with the intimidating prospect of organizing against gentrification. It also highlighted the phenomenon where, in wituations where home ownership opportunities do arise in the neighbourhood, the families who already live there cannot afford them, and they are taken up by usually young white families from wealthier Vancouver neighbourhoods. The presentation by RIZE on what the finished development will look like confirmed that this is the demographic the project is marketed towards.